The annoying buzzing in Yoshino's ears slowly resolved itself into incessant rapping on the door to his quarters, accompanied by an equally insistent pounding between his temples. "Lieutenant Daigo Yoshino, you are summoned to the Headquarters of Combined Fleet" said a familiar voice. "Very funny, Jiro, now leave me alone to suffer" drawled Yoshino. The voice belonged to staff officer and intelligence analyst Lt. Katsamata Jiro, who happened to be a good friend and fellow participant in last night's rather rowdy goings on in a posh restaurant in Kure, Japan to celebrate the conclusion of a naval strategy conference held on board battleship Nagato. To Yoshino's surprise, the tone of Jiro's voice remained formal and grew more insistent. "I'm serious, Yoshi, there's been something of a stir this morning and others are being rousted out of bed today. This could be bad for you." Yoshino was intimidated and amazed as he was whisked from his quarters to a staff car and thence to the ornate offices of Combined Fleet. Upon entering the room, his ears registered the closing of the door behind him. The remainder of his body froze as he realized that the room was occupied by Admiral Yamamoto Isoroku, commander of Combined Fleet, Vice Admiral Mikawa Gunichi, commander of BatDiv 3 with his flag on Battleship Kirishima, and Commander Genda Minoru of Combined Fleet. Ironically, it was the presence of Genda that caused the greatest concern. Re-assignments, transfers and other administrative matters were sometimes made in the presence of senior officers, but Genda's inclusion gave this meeting the feeling of a cabal. Yoshino's skin began to crawl. He was uncertain whether this constituted an improvement from paralysis or a worsening of his condition. Genda spoke: "Lieutenant Daigo, it has come to our attention that you discussed certain proposed operations with members of Kirishima's wardroom at last night's, err, spirited celebrations. Please describe what you were told." It is rare that a person of Yoshino's aristocratic upbringing misreads a situation. As the first son of an influential family, political dealings and subtext were as common to his makeup as snow in winter. In fact, it was his analytical skills (and his Mother's embarrassing insistence to his Father that he be kept out of combat) that got him assigned to his current staff position in the first place. It was thus a testament to his powerful hangover, nervousness and general confusion that he thoughtlessly blundered into one of the great miscalculations of his life. "Oh, is that what this is about?" he said with relief. "Several of my table mates had overheard some nonsense about a separate set of war-games on Nagato that simulated an attack by our carriers on the American fleet at Hawaii." Mikawa rumbled an odd coughing sound, but Genda's eyes flickered to the battleship officer for only a heartbeat before resuming. "Perhaps you could explain your assertion that such a plan would be nonsense" he said with a strangely taut voice. Something in his tone awakened Yoshino's numbed instincts, and he began an impromptu summary. "First, it deviates from standard doctrine, which calls for engaging the enemy fleet near home waters in a decisive battle only after submarines, light forces and carriers have attritted his strength in the long approach. Second, it exposes a very expensive strategic asset, namely the ships of Kido Butai and its elite naval aviators, to extreme risks while engaging the enemy near his main base at Pearl Harbor. Third, the distances involved will strain re-fueling capabilities of the fleet or require that it stop at Truk or the Marshall Islands. The former proposal is dangerous while the latter risks discovery and loss of surprise, which would be essential to the operation's success. Fourth, it would leave our forces in the Southern Resource Area without air cover. While strategic surprise has value, and the proposed operation would certainly be unexpected, I would respectfully remind the Commander of the limited success of the surprise attack on the Russian fleet in Port Arthur at the commencement of hostilities in 1905." "A textbook summation of the operation's flaws, Lieutenant. Is there anything to recommend it?" At Genda's question, Yoshino detected the slightest movement from the heretofore passive Admiral Yamamoto, just a momentary leaning forward, like a whispering breeze in a summer garden. Whatever test this was, he sensed it was crucial. "If surprise is maintained, and if our aircraft are capable of prosecuting an attack against a fleet at anchor, one might expect similar results as the recent British assault on the Italian fleet at Taranto. Crippling or sinking significant elements of the American Pacific Fleet could give us time to seize the Southern Resource Area unmolested. However, given the high risk of loss of our carrier strike force, I would only recommend such an operation if for some reason we believed that Japan was significantly overmatched in a potential conflict with the United States and needed to quickly force a decision." something to read other than combat reports every day -and nicely done too! Thus begins my companion AAR to Cuttlefish's "Ship of Steel, Men of Valor." We plan to await general release of the current beta patch before commencing hostilities, and until that point Cuttlefish is very welcome in this thread. First, I want to say what an honor it is to be selected as the opponent for Cuttlefish's new "Hibiki-style" AAR, which looks at the Pacific War from the perspective of the USN Destroyer Gridley. I was a huge "Small Ship, Big War" fan - in fact that story was one of the primary motivators to make the leap from an AI player to PBEM. My AAR will be more along the lines of my previous games, with a full perspective from the halls of Imperial General Headquarters a/k/a Cribtop HQ. However, in honor of the project that these two AARs are undertaking, I do plan to shift to first person accounts of key moments in the war, and the post above is my first effort at such a vignette. Given the differing nature of the AARs, I suspect many readers of Cuttlefish's journal will also be following my account in order to understand better what's happening in the broader war. I have no problem with that but would respectfully ask all readers of both sides to be extra careful about comments that could violate OpSec for either CF or myself. PS - I notice it is now after midnight and thus officially March 2nd. Happy Texas Independence Day to everyone! Hopefully an auspicious sign that this AAR begins on such a red letter date for us Texans. - Must pay PPs at the LCU (not HQ) level for restricted commands to cross national boundaries. Exception: Royal Thai Army units are allowed to enter Burma only (due to historical promise by Japan to Thai government that they could occupy parts of Burma). - No strategic bombing by Japan in China ever. - No strategic bombing by Allies in captured Allied territory until 1943. - No 4E naval bombing below 10,000 feet. - Invasions only in base hexes. - No abusive paratroop fragment drops (i.e. try to get as much of the unit into the target hex as possible given available resources, don't drop one para LCU on multiple hexes in same turn, etc.). - Non-historical start. However, Japanese player will not re-direct invasions to implausible turn 1 targets (e.g. Java or Hawaii). - Allies can only give orders to existing TFs on turn 1. Force Z may be re-directed from its kamikaze run on the Malaya invasion beaches. - Only one Japanese port attack on turn 1. - Avoid silliness with high altitude sweeps. We will not develop a hard and fast rule on this unless deemed necessary. Both CF and I are more historical players and don't anticipate either party pushing the envelope. These HRs may be subject to change after reasonable discussion if an issue arises and both players will of course seek to avoid "gameyness" in general. Status: offline A few abbreviations I use commonly. I may add to this list as we move forward. 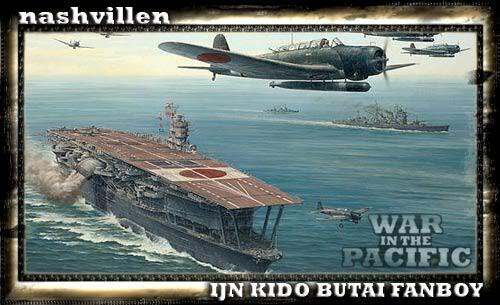 KB - self explanatory, Kido Butai, the Strike Force of the IJN. KBL - my shorthand for what many players call Mini-KB (mini-KB takes too long to type and KBL is consistent with CVL). MKB - Mega KB, the force created when KB and KBL operate together. SCTF - a surface combat task force, SAG in modern parlance. LCTF - a type of light SCTF, usually 3CL and 6DD, that we determined is very effective at chasing off or hunting down PT boats and other light combatants. Air Division or Air Flotilla - a new doctrine, refers not just to the HQ itself but the up to six air battalions and/or companies plus at least 3 AA units that will operate together to ensure good support of major ground or sea operations. In other words, we will make sure that the invasion of Burma has a specific group of base force and AA units that are semi-permanently and informally attached to the 3rd Air Division HQ. Torpedo enabled - a base that can draw on an air or command HQ to arm strike a/c with torpedoes. Chain Invasions - Early in Phase I, we often load multiple amphibious TFs and invade multiple targets in sequence covered by a powerful SCTF, an LCTF, an ASW TF and usually KB or at least strong LBA. This is seen as the best early war balance between operational speed while the Allies are weak and force protection. We usually invade the base furthest from safety first and then march back toward home waters. Dud or duds - a shorthand for a sub attack that hits but does not explode, e.g. "Seawolf duds on a TK near Borneo." Casualties. We list the enemy's casualties first, then ours. If a ground battle, we put squads destroyed in parentheses. For example: "DA takes base X with 10:1 odds, casualties 2300(100) vs 150(10)." Status: offline Good luck Cribtop! But great start yourself. It will be very interesting to read both. Status: offline Good luck Cribtop, looking forward to the ride! Only a true Texan understands the significance of this day. July 4th is almost as important, but not quite. Man I LOVE being a Texan. Status: offline Hi Crib. I saw your AAR title and thought I'd pop in to say "because youre the bad guy!". Whipple, I doubly appreciate March 2nd as I was originally from San Antonio. The fact that the independence deliberations were occurring during the siege of the Alamo was always interesting to me. Congrats on a great match. I hope you and Cuttles will have weeks and months and years of pleasant and challenging competition. I know one thing - you guys have drawn reliable opponents. That means that all the rest of us in the peanut gallery get to enjoy lots of good AAR entries for a long time to come. Status: offline Thanks, Dan. I'm really looking forward to it. Just need that darn patch! I would respectfully remind the Commander of the limited success of the surprise attack on the Russian fleet in Port Arthur at the commencement of hostilities in 1905." At Genda's question, Yoshino detected the slightest movement from the heretofore passive Admiral Yamamoto, just a momentary leaning forward, like a whispering breeze in a summer garden. Whatever test this was, he sensed it was crucial. "If surprise is maintained, and if our aircraft are capable of prosecuting an attack against a fleet at anchor, one might expect similar results as the recent British assault on the Italian fleet at Taranto. Status: offline True enough, Capt. That was so critical to the attack that Yamamoto was willing to abort if the torps could not be made to work in the shallow harbor. The Alamo....*removes hat* Moment of silence. South Carolinians with a knowledge of history understand too. Status: offline Yeah. South Carolinian Martians. Status: online Subscribed, will be interesting to see the other side of what CF is doing with the Gridley. Status: offline As we may have discussed, Mynok, my Dad's family is from South Carolina, so we are very fluent in Palmetto. Our family joke was "grits for breakfast and fajitas for lunch." Status: offline Best of luck! Status: offline I thought I'd drop by while I still can and wish Cribtop good luck in the game ahead. I'm really looking forward to it. And to say that I enjoyed the opening entry of his AAR and I'm sad I won't be able to read any of the others. I am a Yankee, born and bred, but in honor of Cribtop one of the protagonists in my AAR is from Texas. Status: offline I noticed the inclusion of the Texan and appreciate it, CF. Like you, I'm dying for the patch. I feel like I have a new corvette convertible with no gas in the tank right now. Still, it gives me more time to plot your demise. This simile is so Japanese. Status: offline Thanks, Kaleun! It will be a challenge to write from another culture's perspective but it's good to see my first effort has hit the mark. The primary reason for this post is to note that I have updated the house rules post above. Cuttlefish, please review and confirm I got everything from our e-mails. Status: offline Confirmed! The list looks good to me. We are ready for battle. May the Emperor's reign last 1000 years! No, wait, that's wrong. After all those games as Japan old habits may be hard to break. Remember Pearl Harbor! Charge! Status: offline Hehe. CF, that reminds me of the movie Charge of the Light Brigade. When the British generals learn war has been declared they pull out a huge map of France and begin to plan the usual strategies. Then a younger officer interrupts and says "Excuse me, sir, but we're at war with Russia. The French are our allies this time." I look forward to watching you and Cuttlefish go at it! I wish I could discipline myself enough to do an AAR. I have two great games going right now vs. rjopel (Scen #1, me-Japan, just ending Sep 42), and vs. javnavy (Guadalcanal, me-Japan, just ending Aug 42). I am starting another Scen #1 with Rusty1961 with myself being Japan. I find the non-combat side of Japan to be intriguing and addictive! Status: online Have you ever heard of "Federation & Empire"? It is the strategic side of the SFU and would be right down your ally if you like WITP:AE, which I assume you do. Myself or rjopel can give you more information, if you are interested. Status: offline Played two campaigns cover to cover, my friend! Attacked the Gorn on game turn one 'cause, well, they're the Gorn!